Fire Starter Version 1.0 – Simplify your life with Fire Starter on any AppThemes Theme. With Fire Starter you get extra FeedBurner feeds on all themes. 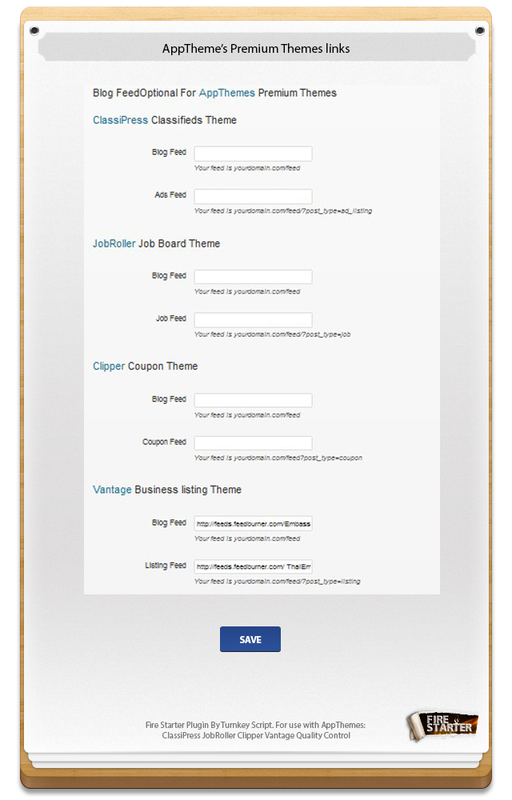 You get an easy way to get approval on all webmaster areas, no need for extra coding or modification of theme. Get free backlinks & an SEO report when someone copies your content. 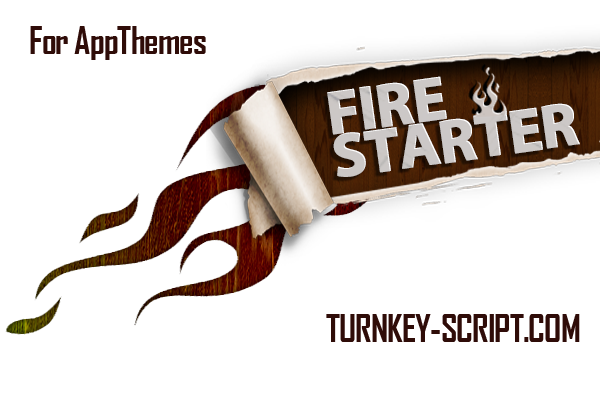 Fire Starter is already installed on 300+ WordPress blogs, we listen to our customers. Fire Starter works with most any WordPress theme. – Save time, save money, no more coding or hiring webmasters. – Get free backlinks when someone copies your content through Tynt. – Display up to 3 Extra RSS feeds / Feedburner Feeds in easy widget! 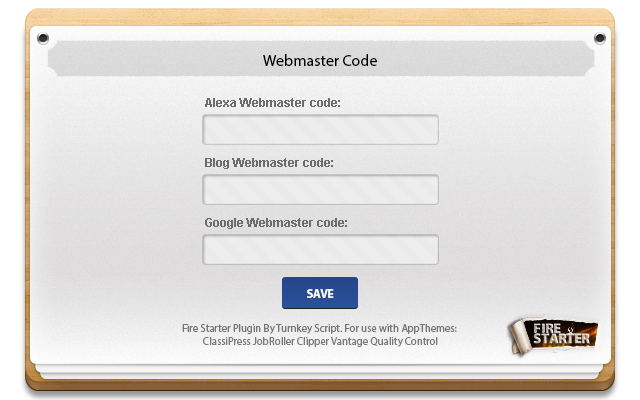 – Take control of your webmaster areas with one click in Alexa, Yahoo, Bing and Google. 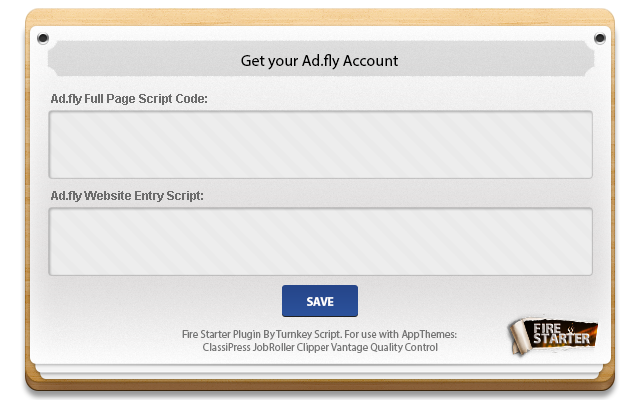 – Create extra revenue with links through Adfly! 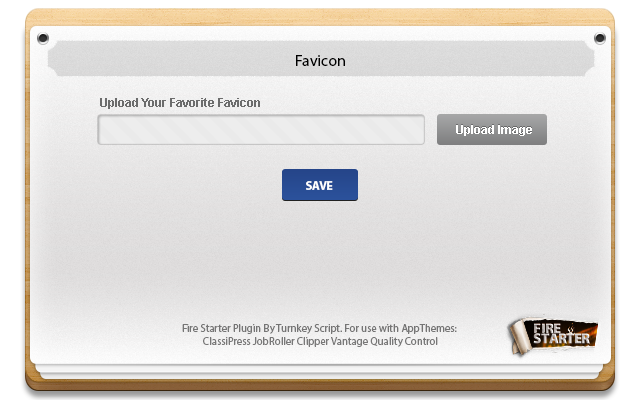 – Complementary, easy Favicon uploader for Vantage. – New quarterly solutions based on customers feedback. 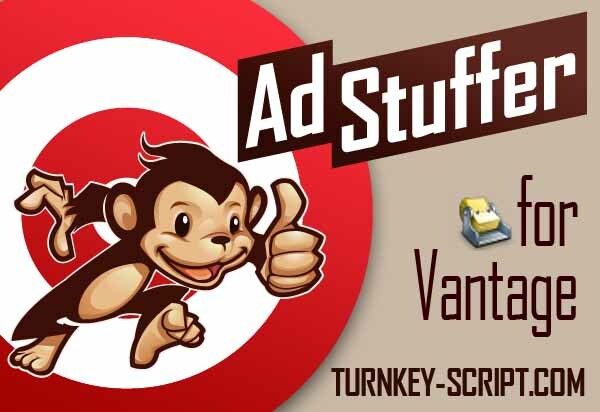 – One easy setup for Listing and Coupon Feeds from Vantage, Clipper, ClassiPress and JobRoller! – Easy installation with FTP or WordPress admin in AppThemes based website. – No edit in code with update! – Clean & Trusted Code! – No need for Child theme! According the AppThemes License use on all AppThemes sites. We will support the Fire Start according to the AppThemes License you have. We normally answer within 12 or less per email or forum. 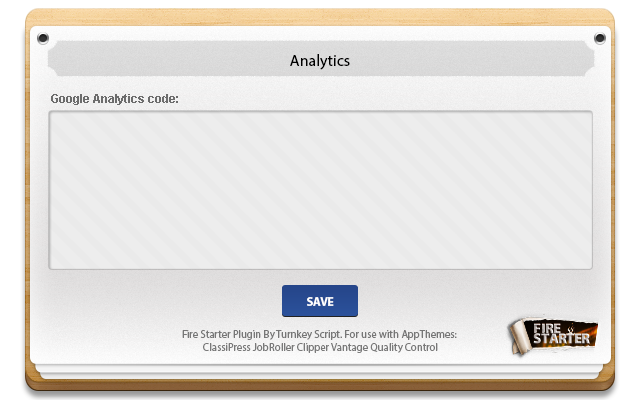 The Fire Started Plugin works on ALL AppThemes all versions not only the once we listed. Correct, we do not give support for third party services, but we love to help. Yes, AppThemes.com Forum or/and http://www.greenhatforum.com you need to sign up with your own domain no free email. No only the once you need and want. Yes, http://www.greenhatforum.com you need to sign up with your own domain no free email. 1. Upload `firestarter` to the `/wp-content/plugins/` directory or import the zip file from Wordpress admin. 3. Put your personal activation code in each box and click save. 4. There is a link to each service in the plug-in admin. You need to sign up on each service provided in the Fire Starter plugin. Each code can be found on the websites and linked within the admin panel. We do not provide any official support to get each code, but we love to help. Looking good is this working on cp 3.2.1 and wp 3.5?? Hello, YES for sure. We just got it approved yesterday and it is tested on all the new Themes. Works on a normal WordPress theme as well no Issues. Hello there! This plugin allow to create and submit sitemaps to Google and Bing? That’s the main reason to buy this and abandon WordPress SEO by Yoast. This plugin is still being maintained, right? Off course we still working on updates no issues on our end. But Sadly this will not create a sitemap it have some SEO functions but not the create sitemap one. Hello again. Just wondering: is it planned to add sitemap features to the plugin? You mean a normal Sitemap? But there are so many script that do this already right? Place more banner ads and AdSense ad spaces on your ClassiPress site. Stuff your JobRoller Theme with 14 extra Ads & Links!